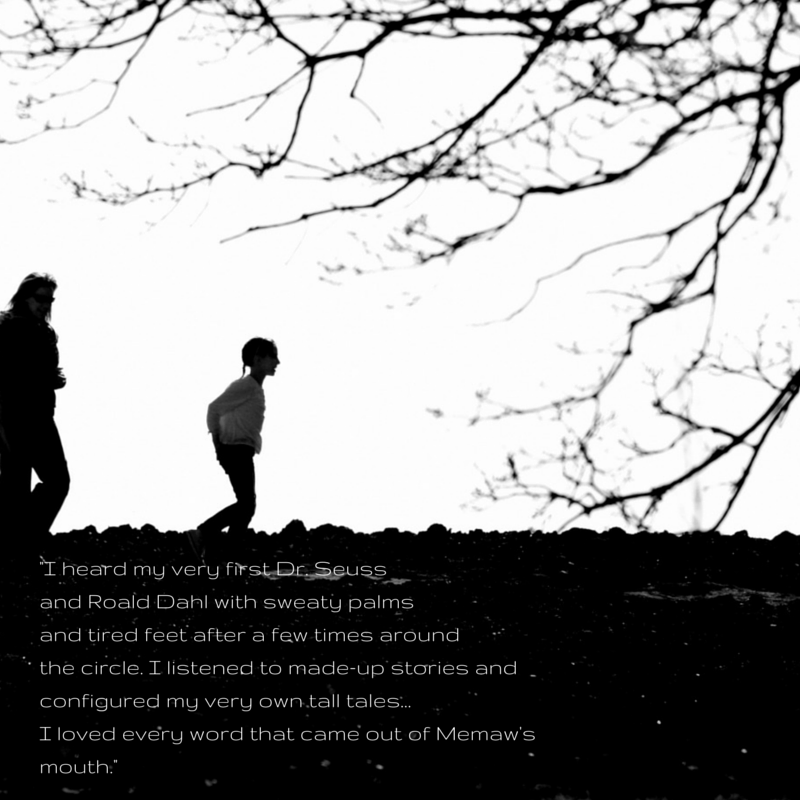 Creative Non-Fiction: Walks with Memaw by Karli Land | LADY. The sun starts to make its way into the western sky, leaving in the clouds behind it the most radiant shades of red and orange. Dark is coming, which only motivates me to clear my dinner plate faster, knowing that I won’t be excused from the table until I do. After I get the okay from Momma, I jump up from my seat and run full-force through the house and out of the front door, causing the screen door to slam closed behind me. Dad shouts a warning - “Don’t slam the door!” - but I don’t even look back. I make my way across the driveway and over into the next yard. Outside, my Papaw is watering his well-kept rose bushes and manicured lawn. He lifts the water hose my way, pretending that he is going to soak me with it, but I know better from the many times we’ve played this game before. I make my way through his yard and up to the house. I sling open the front door and yell inside. I wait to hear the small, sweet voice of the woman who makes my world turn. I know she’s in the kitchen, finishing up the dinner dishes, but I don’t dare step inside with my shoes on. “Almost ready,” I hear my Memaw call out. It doesn’t take much to keep a six-year-old girl from Frostproof, Florida entertained. We head down the driveway together and start out on our mile-long walk, which consists of walking the streets of our neighborhood, Overocker Circle, four times. I don’t remember the days before our walks started; in my mind it’s just what we’ve always done. I don’t think it was the walks I enjoyed but, rather, the games that were played along the way. We sang nursery rhymes, played "I-Spy", told stories, and talked about our day. Walks around that little country block are where I was first introduced to Baa, Baa, Black Sheep, The Three Bears, and Henny Penny. I heard my very first Dr. Seuss and Roald Dahl with sweaty palms and tired feet after a few times around the circle. I listened to made-up stories and configured my very own tall tales. Those moments were, without a doubt, where I first formed my love of words. I loved every one that came out of Memaw's mouth. And now I wish so much to have the opportunity to hear them all over again. As I memorized the songs and stories she taught me, I immediately began teaching them to my little sister. I just knew she would need to know them one day when it would be her turn for walks with Memaw. Our walks got fewer and fewer, and we began taking along a notebook full of our little rhymes. I only recently realized its purpose. My Memaw was losing her memories. My little sister would never enjoy the long walks and playful songs with her the way I had. Alzheimer’s took that opportunity away before my sister was old enough to even understand what was happening. I write every day of my life now. Oftentimes I think of my Memaw while I do, knowing that she would be proud of me following my dreams. I am so grateful for the time I had with her and the writer that I have become because of those moments. I wouldn’t trade it for anything in the world. I keep my own notebook now and, one day, I'll share it with my grandchildren as we hurry through our dinner plates, rushing outside to meet for our walks. 6 comments on "Creative Non-Fiction: Walks with Memaw by Karli Land"
Love this so much! Love the first paragraphs. I can hear the screen door slamming shut, and I can see young Karli racing from yard to yard. Beautiful memory. Great writing. Thank you, as always, Amber, for your kind comments! Nice verbal picture. I enjoyed the story. Thanks Cheryll! We are so happy to have yours and Karli's stories to share with our readers.